We're just over the half-way mark! July marks start of the second half of the year and also signals the arrival of the really cold weather. For Cape Town's sake, we hope it also brings much rain! The winter school holidays started towards the end of June and only ends on the 17th of July 2018, which makes the first half of the month a peak travel period. Flight prices are the most expensive towards the beginning of the month and around the 15th and 16th, when travellers are returning home before the new semester. Flight prices are generally more affordable from the 16th of July onward. Kulula JHB to CPT : The cheapest dates to travel on can be found towards the end of the month. Kulula CPT to JNB : Mid-week flights are a great option for budget travellers. Kulula Lanseria to CPT : Flight prices are fairly consistent throughout the month, with weekend flight prices slightly elevated. Kulula CPT to Lanseria : Budget-conscious travellers should avoid travelling on the first of the month where possible. 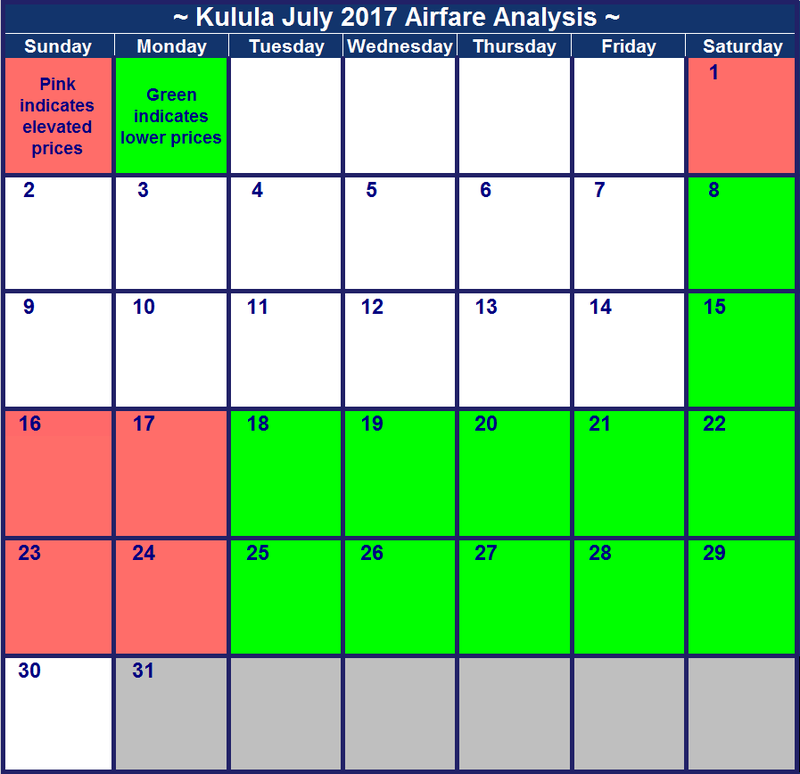 Kulula JHB to Durban: Affordable flights are readily available throughout the month, with the cheapest travel dates highlighted in green below. Kulula Durban to JHB: Where possible, travellers should avoid weekend flights as those are the most expensive. Kulula Lanseria to Durban : Passengers should avoid travelling on the 6th where possible as that is the most expensive date to travel on. Kulula Durban to Lanseria : Sunday flights are the most expensive on this route, with the 1st and 8th of July particularly expensive. Kulula JHB to George : Flight prices are cheaper from the 16th onward when the school semester resumes. Kulula George to JHB : Friday flights are currently the most affordable on this route. Kulula CPT to Durban : Avoid travelling during the first half of the month, when flight prices are ridiculously expensive. Rather travel during the second half of the month. 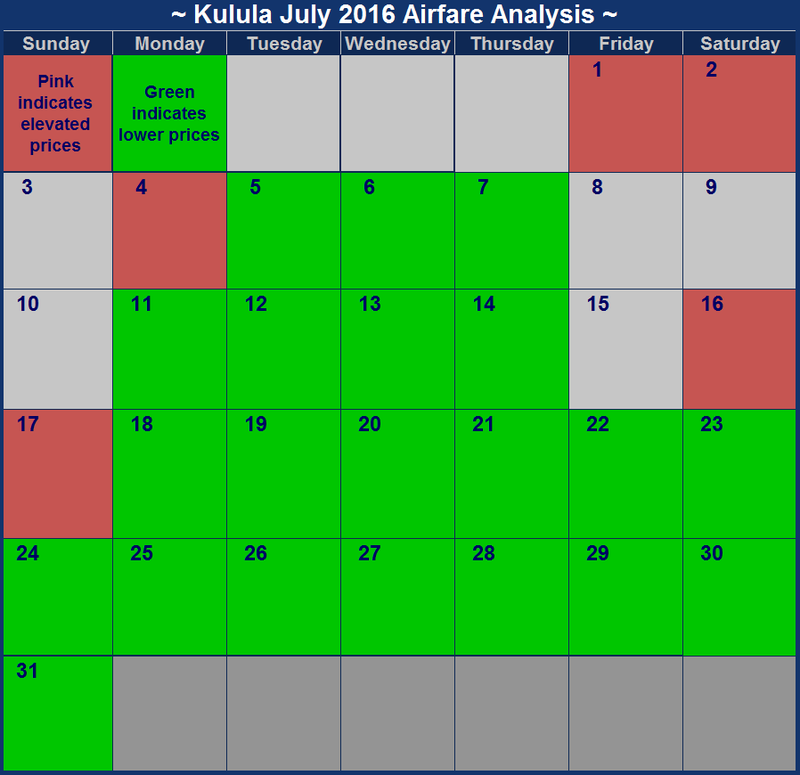 Kulula Durban to CPT : Look out for dates highlighted in green for budget friendly flights. 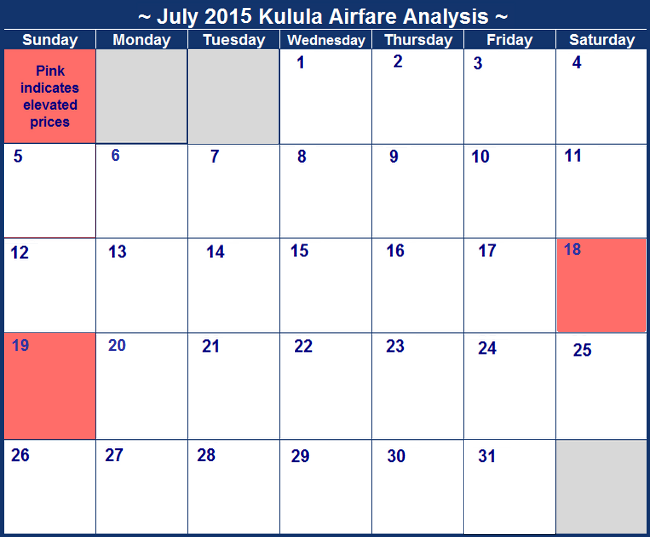 Kulula JHB to East london : Flight prices are incredibly stable during the month of July. Avoid the 21st and the 28th as prices are elevated on those dates. Kulula East London to JHB : Where possible, avoid travelling on Saturdays and Sundays. The winter school holidays start at the end of June and ends on the 23rd July 2017, making July a peak travel period and generally not great for those on a budget. Surprirsingly airfares are fairly affordable considering, but if you are a budget conscious traveller look out for dates highlighted in green below. Weekday flights are generally the most affordable, but towards the end of the month Monday flights also become slightly more expensive on some routes. Kulula JHB to CPT : The cheapest dates to travel on are in the first and last week of the month. Kulula Lanseria to CPT : Flight prices are fairly consistent throughout the month, with prices slightly elevated from the second half of the month. Kulula CPT to Lanseria : There are only three dates to avoid if you are on a budget: the 21st, 22nd and 23rd. Kulula JHB to Durban: Surprisingly affordable flights can be found on Saturdays and Sundays, making a weekend break a budget friendly option. Kulula Durban to JHB: Affordable flights can be found on Tuesday - Fridays, making it the best time to travel. Kulula Lanseria to Durban : Affordable prices throughout the month, but if you would like to get the cheapest prices then travel during the second half of the month. Kulula Durban to Lanseria : Affordable prices throughout the month, but if you would like to get the cheapest prices then travel during the last week of the month. Kulula JHB to George : Affordable prices throughout the month. Avoid travelling on the 7th and the 13th, as flight prices are extremely expensive. Kulula George to JHB : Affordable prices throughout the month. Avoid travelling on the 16th and the 17th, as flight prices are extremely expensive. July marks the end of the school holidays for most parents and the start of the second semester for students. As many locals are heading back home or to university after the holidays draw to a close, flights are more expensive. The school holiday draws to a close on the 17th of July 2016, making flights on the 16th and the 17th more expensive than the rest of the month. So be sure to head home before the weekend if you want to save on back-to-school flights. The 18th also marks Mandela Day, which is not a public holiday this year. Generally, flights after the 17th of July 2016 are more affordable. Kulula JHB to CPT : Flights are the most affordable on Mondays and Tuesdays. Kulula CPT to JNB : Where possible, avoid travelling on the 17th which is the day before the school semester kicks off again. Kulula Lanseria to CPT : Flight prices are fairly consistent throughout the month, with prices slightly elevated on Fridays and Sundays. Kulula CPT to Lanseria : Try to avoid travelling on the 17th of July as prices are elevated for those returning to Joburg after the school holidays. Kulula JHB to Durban: Thursdays and Fridays should generally be avoided if you're after budget friendly flights. Kulula Durban to JHB: Surprisingly affordable flights can be found on Saturdays, making a mid-weekend break a budget friendly option. Kulula Lanseria to Durban : Thursdays are surprisingly expensive to travel on, rather book flights for Wednesdays or Fridays. Kulula Durban to Lanseria : Try to avoid travelling on the 4th, 16th and 17th where possible. Kulula JHB to George : Avoid travelling on the 7th for the start of the Oyster Festival, as flight prices are extremely expensive with limited availability. Kulula George to JHB : The 10th is the most expensive day to travel on as people flock to the Knysna coast for the Oyster Festival. Kulula CPT to Durban : Avoid travelling on the 2nd, when flight prices are ridiculously expensive. Rather travel during the second half of the month. Kulula Durban to CPT : Make sure to head home before the weekend if you want to save on back-to-school flights. 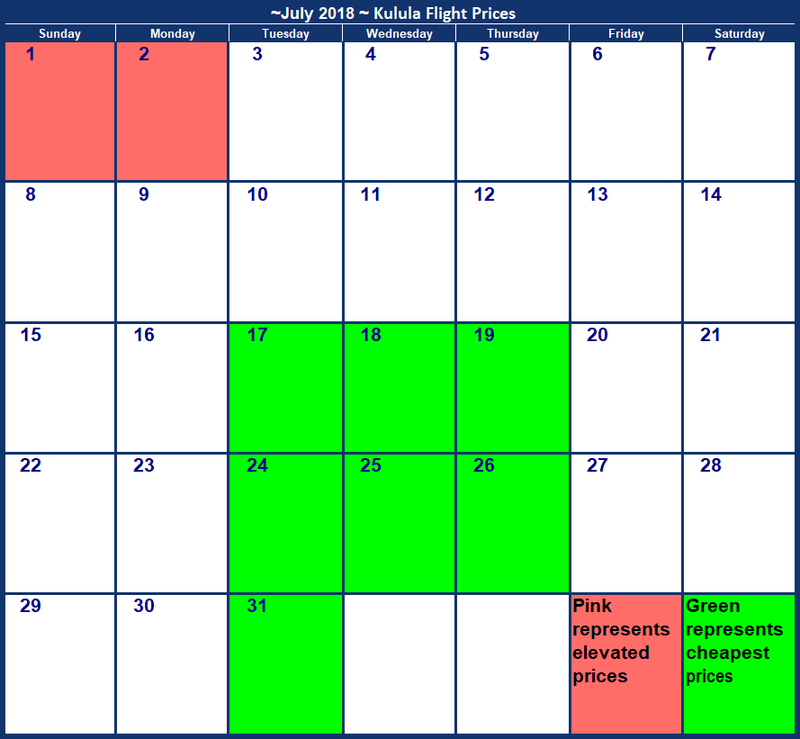 Kulula JHB to East london : Flight prices are incredibly stable during the month of July. Kulula East London to JHB : Avoid travelling on the 15th and 17th of July, when flights are elevated before the start of the school semester. Unfortunately July is one of the saddest months on any South African's calendar. Days are shorter, the weather is colder and there are no public holidays. Durbanites are obviously immune to the effects of July, with their year-round great weather playing a large role in this. It also explains why flights to and from Durban are some of the most expensive this July. Your only chance of cuddling in bed is going back to school as the school holidays last until the 19th of July 2015. Flight prices are clearly elevated during that period. Prices are highest near the end of the school holidays, on the 17th, 18th and 19th of July 2015. Flight prices were surveyed on the 4th of June 2015. The more time that has passed since, the greater the chance that prices have changed since then. Kulula JHB to CPT : Prices on this route are relatively stable, however flights prices are slightly elevated around the start of the month. Kulula CPT to JNB : The 18th is the most expensive date to travel on by far. Kulula Lanseria to CPT : Prices are the same on every day of the month. Kulula CPT to Lanseria : Try to avoid flying on the 18th and the 19th. Rather fly a day earlier or later and you can save R300. 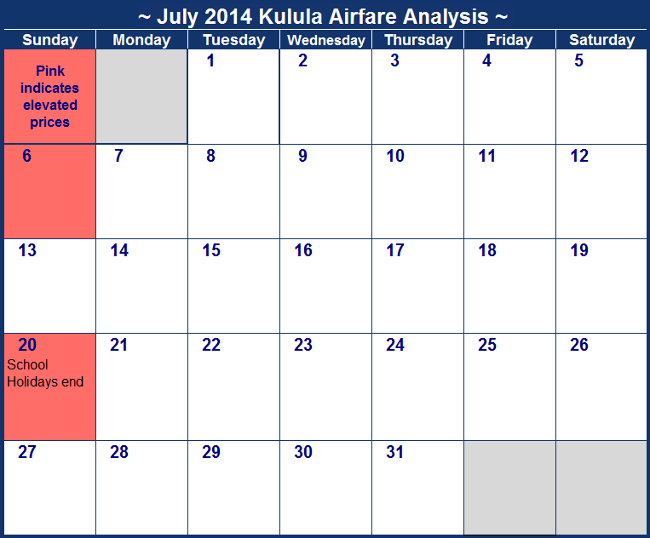 Kulula JHB to Durban: The 2nd, 3rd and Saturdays are the most expensive days to travel on during the month of July. Kulula Durban to JHB: Sundays, Saturdays and Mondays are the days to avoid travelling on. Kulula Lanseria to Durban : The 2nd and 3rd are the most expensive days to travel on. Kulula Durban to Lanseria : Try not to travel on Sundays, which are the most expensive dates to travel on. Kulula JHB to George : This is one of the most expensive routes, with the regular flight price doubling on the 9th. Kulula George to JHB : The 12th is the most expensive date to travel on by far. Kulula CPT to Durban : Avoid travelling on the 11th, when flight prices are ridiculously expensive. Kulula Durban to CPT : Try not to travel on the 4th and you could save yourself close to R2000! Kulula JHB to East london : Flight prices are relatively stable throughout the month of July. Kulula East London to JHB : The most expensive date to travel on this month is on the 18th. July 2014 is one of those sad months with no public holidays. However, there are plenty of school holidays - they end on the 20th of July. It varies from flight route to flight route, but generally the 6th and the 20th of July are the more expensive dates to fly on. The airfares listed below are the cheapest we could find on each day in July 2014, when we set this up.This survey was performed on the the 25th of April 2014 - the longer the amount of time that has passed since we set it up, the greater the probability that airfares have changed. Current airfares can be found at at Kulula. Kulula JHB to CPT : Prices on this route are relatively stable, however flights that depart on the 14th are more expensive. Kulula CPT to JNB : The 2nd, 16th, 20th and 26th are the most expensive dates to depart on. Kulula Lanseria to CPT : This route is pretty stable in terms of pricing, however the 2nd is slightly more expensive in comparison to the rest of the month. Kulula CPT to Lanseria : Try to avoid flights that depart on the 19th and the 20th, just before school restarts. Kulula JHB to Durban: The 3rd, 4th and 5th are the most expensive dates to depart on. Kulula Durban to JHB: Aim to travel on any date other than the 6th, 7th, 18th, 19th and 20th. Kulula Lanseria to Durban : This route is relatively affordable when compared to other routes, however the 3rd, 4th and 5th exhibit elevated prices. Kulula Durban to Lanseria : Try not to fly on the 6th, 7th, 18th, 19th and 20th. Kulula JHB to George : Flights on this route are quite expensive, especially on the 10th. Kulula George to JHB : The 13th is the most expensive date to depart on. Kulula CPT to Durban : The 5th, 6th and 28th are the most expensive dates to fly on. Kulula Durban to CPT : Try not to fly on the 6th and the 20th, as prices are elevated on these dates. Kulula JHB to East london : Aim to fly before the final week of the month, as prices are elevated. Kulula East London to JHB Avoid flights that depart on the 18th and the 20th.